material likely incurred during the shipping process. The damage is cosmetic in nature. Returns for cosmetically damaged suits are not accepted. We are selling suits at a discounted price that were returned by customers because they were the wrong size. 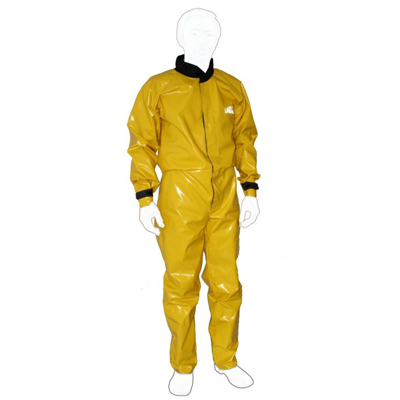 These suits were never worn outdoors, but often have some scuff marks on the PVC material likely incurred during the shipping process. The damage is cosmetic in nature. Made from soft, flexible and durable PVC fabric. All seams are double stitched with special thread, which makes them waterproof. The coverall is constructed to minimize top-stitching that can rub off in hard caving. The front closure seals with 50 mm Velcro. The suit has one internal pocket with Velcro closure. The hood is hidden in collar. The cuff opening is adjustable with Velcro. The internal adjustable and elastic suspender straps lift the bottom part of the coverall. Sizes: see chart below. This product is not eligible for return or exchange.